Assalam and hello to all of you out there. It has been ages I have not updated this blog. I do not know why I became so lazy to write and post something here. It’s been already for months I have kept silent. However, today I feel compelled to update the blog because it is a very special date. I guess the whole world feels today's date is so special to be remembered. Therefore, today I also want to write something on this blog. Actually, at home only umi, ayah and us the furkids. Kak Adik and Kak Baby went to school in JB. While our big sister, Kakak is now studying in college. However, Kakak is now at home because she is on her semester break. We feel very happy when Kakak is at home because Kakak will spend her time with us. We also looking forward Kak Adik and Kak Baby to come back home from their end of year school holidays. I would like to inform you all that we are all in good health. It is only CP at the moment who is having eye problems. He is now suffering from an ulcer in his right eye. It has been almost a month since umi has gone to the clinic for Cp’s eye treatment. 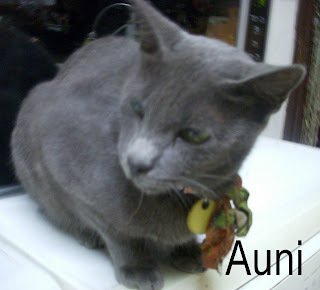 Umi went to see the vet twice with some medications but it seems that his eye ulcer did not show any signs of healing. 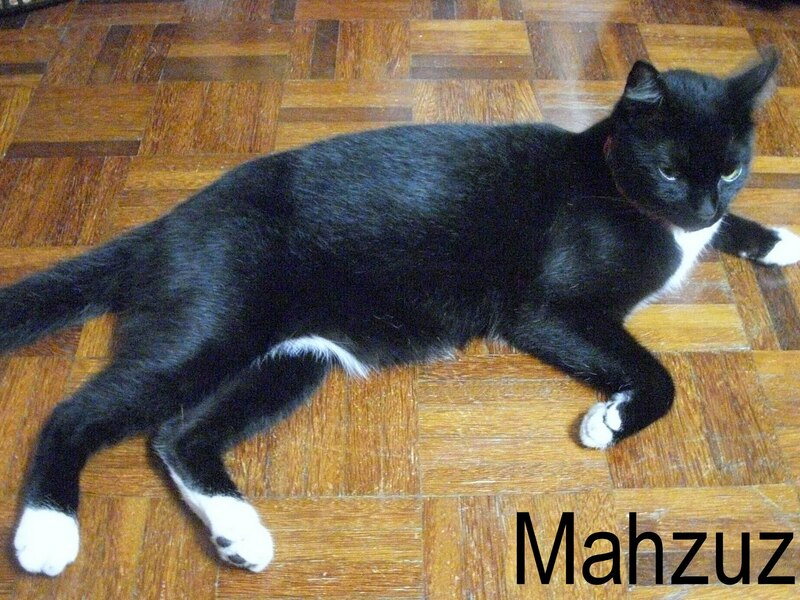 Therefore umi decided to take him to the Animal's Hospital. CP was given some medications and eye ointment but still no improvement. 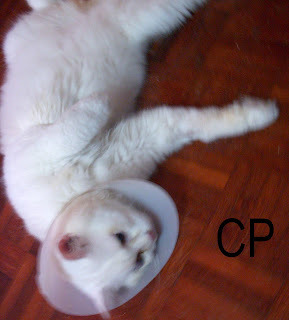 After a week umi took him back to the hospital and the vet told umi that CP’s right eye has to be stiched up so that it could heal better. Finally CP had a surgery on his eye. Today umi and Kakak brought CP to the hospital to unstitch his eye. He was given some medications and eye drops as his eye ulcer has not totally healed. I would also like to introduce the new members of our house. 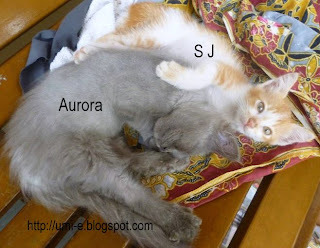 They are SJ and Aurora. 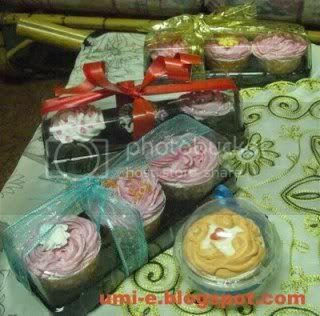 Umi took them from JB last September. 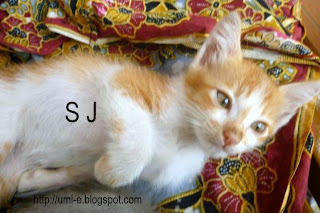 They are so active, especially SJ. He is very playful and he has broken many things in the room. 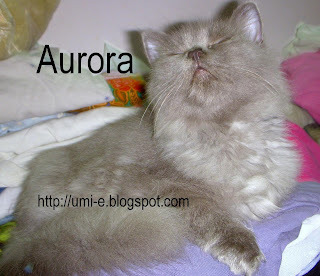 Aurora is not as active as SJ, but she has problems with weeing and pooing because she likes to wee and poo on the bed rather than in the litter tray. She would wee and poo in the litter tray only when umi is in the room. It seems that in front of umi she wants to show her good attitude. We hope Aurora will stop her bad habit and it will help umi from cleaning every morning and afternoon. For your information, Hana will be spayed on the 22nd of November. Actually umi sent Hana to be spayed last few months but the vet can’t continue the procedure because she had problems with her liver and kidneys. Therefore she was given some medications to treat the problem she is having. Now Hana looks good and healthy but the vet advised umi to take Hana to the Animals Hospital because their clinic has not got complete equipments in case the same thing happens to Hana again. 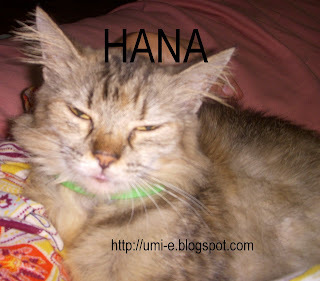 I Hope Hana will be fine during the procedure of spaying her.